Popsicles are a wonderful summertime treat, and while it is entirely possible to make popsicles without a mold and get great results, it’s always a little bit more fun to have some neat molds for making ice pops. There are all kinds of popsicle molds out there – both in very plain and more elaborate designs – but one of my favorite molds are in the shape of the rocket/bomb pops that I was a huge fan of as a kid. 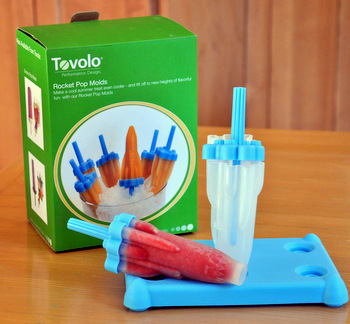 So, I decided to share the pop-love by giving away a set of Tovolo Rocket Pop Molds!Â These molds, which I reviewed here, give pops a fun rocket shape time and again. They’re durable and it is easy to get the pops out of them, no matter what flavor of pop you’ve made . To enter the contest, just leave a comment below and mention your favorite frozen treat â€“ whether it is something simple, that you might find at an ice cream truck in the park, or something more elaborate that you might put together at home or have at a gourmet ice cream shop. The contest ends Sunday at midnight (07/01/2012)Â and one winner will be randomly selected from the entries. Donâ€™t forget to fill in your e-mail on the comment form (it will not be made public), as that is how I will contact the winner, and good luck! Update: Thanks for playing everyone. Comments are now closed. A winner will be announced shortly! When I was little, the ice cream truck offered these pink bubble gum ice cream novelties in the shape of a foot, and they had a gumball where the big toenail should be. So fun! As an adult, I’m all about the local frozen yogurt shop! Bananas Fosters Ice Cream! YUMMY! I love Ben & Jerry’s Phish Food! Homemade brownies and ice cream with hot fudge…can’t beat it! My favorite? Rocky road ice cream. It has everything I love! My favorite is A big bowl of vanilla ice cream mixed with crumbled double stuffed Oreos and a little milk! 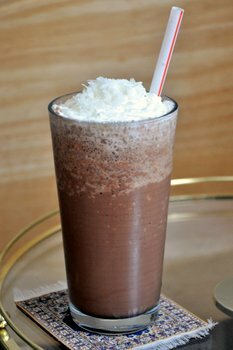 I know it’s like cookies and cream but it is so much better! 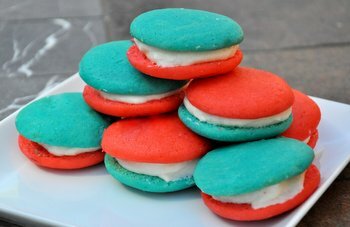 My cousin makes the best homemade ice cream sandwiches ever! Absolutely love them! Peach Bourbon pops from People’s Pops yum! Omg these are sooo cool (in 2 ways) lol. My favorite frozen treat is butter pecan ice cream from the Trading Post ice cream shop in Sault Ste. Marie ON Canada <3 Mmmmm. I just LOVE ice cream. Like, really bad. LOL. coconut popsicles are the best ever ! I made pear-ginger-blueberry popsicles last week. Thinking about fudgsicles this week. I’d love some rocket pop molds for them! Oooh I absolutely adore pistachio gelato… divine!